Chevron waves are alternate mustard, navy, ivory and black. Armpit to armpit is approx 16" when relaxed however the knit is stretchy. Size 12 dress from Aprictor. Very flattering. Nice tie detail on the back. 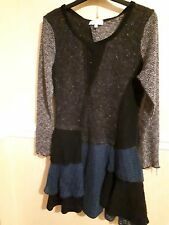 3/4 sleeve knitted Jumper dress, Apricot, size L. Black with Grey centre panel. V neck back and front. APRICOT TUNIC STYLE JUMPER DRESS. FLORAL ACRYLIC WITH 5% ELASTANE IN GREYS. 3/4 SLEEVES. APRICOT JUMPER DRESS. Gorgeous sleeveless grey jumper dress with circle pattern which is lined with a petticoat with black crocheted detail at hem, in great condition. Size XS 6-8. Apricot 10 12 medium dress knitted black grey. Condition is Used. Dispatched with Royal Mail 2nd Class. To be honest the size is a little tricky as the label is missing. I bought this for myself and I am a short size 10. It does not fit me. It would be suited to someone taller than my 5 foot. I would say it is more like a 10/12. It really is a lovely dress. Lightweight knit with mohair. Green Dress size 8. Ideal for day or night. In excellent condition. Worn a handful of times. From smoke free home. Apricot Dress size Medium. Used but very good condition. Eye-catching design with crocheted detail bodice & woodland scene around the skirt. I received compliments every time I wore it but am having a clear out. Dispatched with Royal Mail 2nd Class. Stunning striped jumper dress from apricot. Lovely thick warm jumper dress ideal for winter can be worn with tights or leggings and long boots for an effortless casual look. Long sleeved. Pretty owl print dress, good used condition, it is a kind of warm fluffy woolly winter fabric, feels like wool but there is none in it. There is fluffing/bobbling to surface of fabric esp.to the sides of dress and around bum area, as pictured, freshly laundered, ready to wear. Apricot - Womens Stripe Jumper Dress - Size 14 - Worn Once - Excellent Condition. Condition is Used. Dispatched with Royal Mail Signed For® 2nd Class.